With the highest strength-to-weight ratio of any hunting pack on the market, The Badlands Diablo Dos can swallow 40 pounds like it was nothing, and still ensure that you stay comfortable and dry. The secret lies in its Hypervent™ Suspension, which consists of a load-transferring frame that has been flexed and configured to provide ample room for cool air to pass freely between you and your pack. With the highest strength-to-weight ratio of any hunting pack on the market, The Badlands Diablo Dos can swallow 40 pounds like it was nothing, and still ensure that you stay comfortable and dry. The secret lies in its Hypervent™ Suspension, which consists of a load-transferring frame that has been flexed and configured to provide ample room for cool air to pass freely between you and your pack. As a matter of fact, any part of the Diablo Dos that makes contact with your body has been pierced, popped and perforated. This results in free flowing air and the virtual elimination of energy-robbing heat. This pack is not only made to move fast but to carry a bow as well (duct tape not included). There is also a place for hydration and additional straps for bedding and extra clothing. Badlands KXO-32 fabric is the strongest, quietest, most waterproof material in the hunting world. How do we know? Because we tried 31 different combos before we finally got it right! Soft, supple, quiet....everything you&apos;ve always wanted in a hunting pack...and a mate but, that&apos;s a debate for another time. Let&apos;s face it....You put a lot of stress on your hunting gear. As you should! Certain areas of your pack are bound to take more abuse than others. Through a scientific process we call "beating the living hell out of it" we found these "high stress areas" and added reinforcements. Hypalon is one of the highest strength, yet flexible materials known to man and we had to have it. We bought up the world&apos;s supply and use it on all high stress areas on all Badlands packs. Why go the extra mile you may ask? Because at Badlands the giving never stops. Any endurance athlete or mechanic for that matter will tell you that the biggest threat you face when it comes to performing at peak levels is HEAT. It depletes your body of energy faster than any other factor. 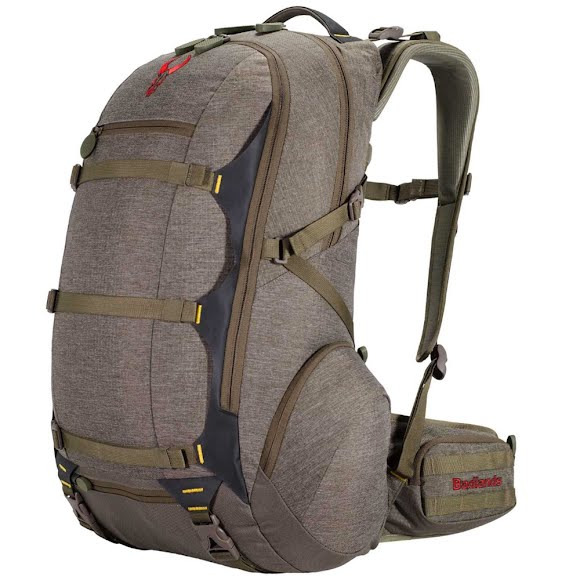 Badlands Hypervent Technology was designed to allow high volumes of air to pass between you and your pack. This allows you to stay cool and dry in even the most extreme environments and stay at those peak performance levels longer. Badlands Hypervent packs were also designed to wrap around your body&apos;s shape and work with your body&apos;s natural movement instead of against it. The result is long lasting comfort, increased stamina, reduced sweat and even reduced odor. Your friends will thank you....your prey will not. Dimensions 23" x 13" x 12"